How Can I See Top Activities Engaged With My Campaign? See the top activities of your campaign. To check out the top activities engaged with your campaign, head over to your LimeSpot admin panel. Step 2: Click on the Campaigns tab and select which campaign you want to see the shoppers activities. 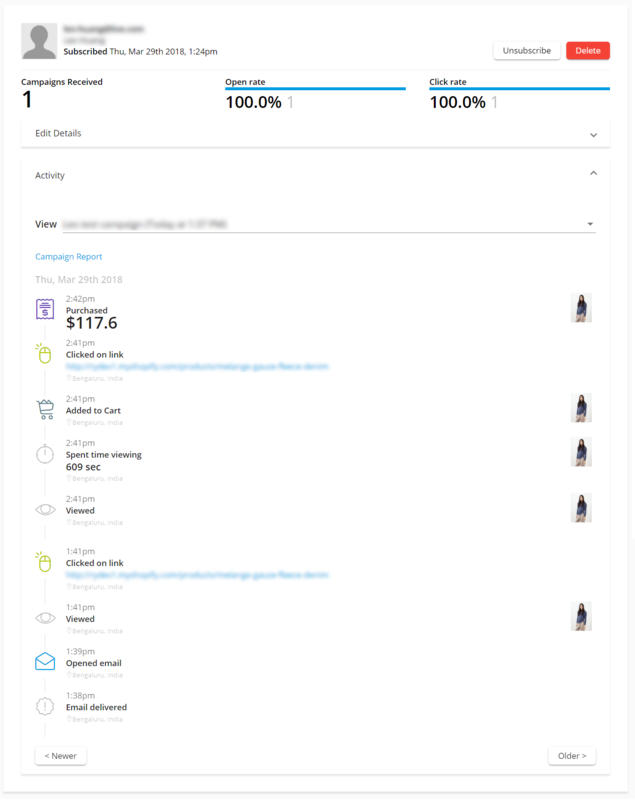 Step 3: You will see your Campaigns analytics. You will see an overview of your campaign's analytics. At the top of this page, you will see a tab that says Activity. Click on it to see the Activity data. Step 5: Click on a recipient and you will see their detailed Activity for a specific campaign. Choose the campaign on the drop-down under View. The activities that you will see are when the shopper opened the campaign, clicked on a link in the campaign, bought a product, click on different products during that session on the store and other activity the shopper does during that session. Note: Under the detailed activity for the recipient, you will see all the clicks of the shopper during the whole session once the shopper opened the Approach campaign.